"I hear the clatter of swords and torches outside the cave as the soldiers come for me. In a moment their faces will relax when they see a skinny, outnumbered boy. They don't realise how dangerous I am. That I have monsters inside me. I want to shout out and warn them to run, but I can't. And then the violence begins. . ."
What if your body was not your own? What if you had vast strength, but were used as a weapon? A gripping story about the power of possession, and the power of freedom. I may never have heard of Chris Aslan before receiving this book from Lion Hudson, but according to the reviews of the back of the book, he's rated pretty highly by The Sunday Telegraph, The Independent and the Times Literary Supplement. Chris has published couple of books, one is a guidebook called "A Carpet Ride to Khiva" and the other is a Biblical historical fiction story called "Alabaster". 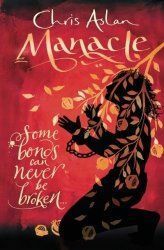 "Manacle" is set after the events of "Alabaster" in similar area and continues the larger narrative on 'The Master' but introduces a new protagonist. Phineas, or Phin, is a teenager living in an unnamed village near to the Great Lake. His family are fish salters, and his and his younger brothers' life consists of waking early and greeting the fishing boats as they arrive back from their nights work, and then running the fish back to his family so that they can salt and dry them. However there is something different about this story, it is told from the perspective of evil Spirits who are watching the events, awaiting something big that is going to happen, so that they can feed on the negativity. The event happens when his abusive Step-father, Aqub, returns home drunk and in a bad mood. In an effort to stand up to him for the first time a fight ensues and mother and two sons run into the night. The Spirits have a great time as they watch the mother head to the house of the 'Teller' in a hope that he may be able to heal Phin from his broken bones and provide him protection. The protection that the 'Teller' provides see's Phin suddenly play host to thousands of evil spirits that have been invited in. The spirits give him extra strength and are determined to 'protect' him from his Step-Father, which results in Phin having to flee the village and live as an outcast in the caves of the dead. The spirits inside him keep him alive, give him unnatural strength and viciousness, so that even his own family cannot approach him. The spirits torment him, when he has food they make him drop it, he is out of his mind and cannot even kill himself. This torment lasts for some time until one day a boat arrives in the very small cove and Phin has an encounter with the Master, the spirits are sent away and Phin is free, but can he ever really be free. Held to the guilt of what he has done he cannot return to his village, or his family and instead must flee to another village where they don't know him and work out what the Master meant by his words. If you are familiar with Bible stories then this will no doubt sound fairly familiar to you, at least the bit about the man in the caves of the dead, inhabited by demons and approached by Jesus who casts the spirits out into the local pig herd. In the Bible we just have this snap-shot of the man and his encounter, we don't know his past and we don't find out what became of him. So this book "Manacle" fills in the gaps. Giving the man who, in the Bible text, identifies himself as 'Legion' a back-story and a possible future fills out this character beyond the Sunday School lesson. Drawing from his youth growing up in a village in Turkey, the author manages to create an incredibly believable world for Phin to grow up in. Additionally the experiences that Chris has of craftsmanship and trade in the area means that he can invest the character into the trades that he needs to learn to stay under the radar. Obviously there are many items that are speculation but this story allows the author to investigate a lot of different aspects of life that reflect on today. The idea of people of different religions being able to live and work alongside each other and the differences between them. It looks at how dividing Jesus teaching were and in the background of the very formal religion how different he was. It looks at the beginning of the spread of the early church and investigates reactions to the miracles and the coming of the Holy Spirit. So often the stories like this tell of the death of Jesus and positions the lead character somewhere at the foot of the cross, this book places the protagonist out in the villages, wondering where on earth the Master could be and hearing second-hand about the events in Jerusalem. I don't want to give away too much about where this book takes the story, but it's definitely not the ending that I expected! This is such a well-written book it is like looking through the characters eyes and really seeing what is going on. If you read this, even as someone who has heard and read the stories many times, I think they will give you new insight into the early Church, how it started and came together, but also simple understanding of what it meant for Jesus to touch someone considered unclean by his society. The book flows nicely and it seems each aspect of the narrative is chosen with great care unwinding the story and bringing it to it's slightly unnatural conclusion. Highly recommended, but just a warning, just because it's a Bible-based story, it does not mean that it is suitable for children, this is an older-teens and adults book. I got lost in this adventure and thoroughly enjoyed the characters, landscape and mystery throughout.